At PAX East, Square Enix announced updates to Final Fantasy XV. This involves its multiplayer mode, Comrades, which will update the game twice in this year. They also announce that 4 character will have their own episodes in 2019. They are Ardyn Izunia, Aranea Highwind, Luna Freya, and Noctis Caelum. 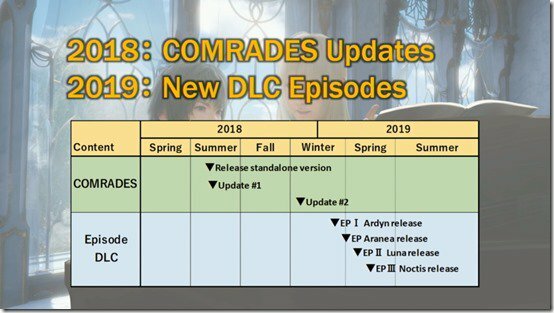 For Comrades, it will get a standalone version in the Summer this year. This is odd move. The multiplayer serves to compliment the single player, ala Mass Effect 3. Data from the multiplayer mode is incorporate into single player, such as your character avatar and progress. Why would you separate it if its already part of the Royal Edition packed in? Do people want to only play the multiplayer only? This story portrays the struggles of Ardyn. Witness the resentment he harbored towards Lucis for over 2000 years, and his clashes with the Astrals. It will be out in the very beginning of 2019. A side-story about the Starscourge depicted from Niflheim’s perspective. The final day of the Empire turns out to be Aranea’s worst day. It should be out in early Spring 2019. This story’s about Luna’s fate, which not even death can free her from. Her battle to save the one she loves overturns the destiny dealt to the Lucian King. It will be out in Spring 2019. Parting ways with the Astrals, Noctis embarks upon his final battle in order to attain the ideal future for all his people. It will be out in Spring 2019. This is most likely a result from the fan survey that sent back in 2017, asking what they would like to see in future updates. While I appreciate the idea and it will expand the lore and universe of Final Fantasy XV, this is looking to be questionable. What I mean is that they have plans for this game to last to the beginning of 2019. We just had the release of the Royal Edition and the PC version, and now they announce DLC after it. Looking at the total size file for the game, it’s just about at 100 GB. When will they feel that this game will be finally complete? Final Fantasy XV is currently available for PS4, Xbox One and PC.